Disclaimer: Please forgive the academic nature of this post. This is a paper I recently wrote for a class but I hope you can weed through it to glean some useful things. 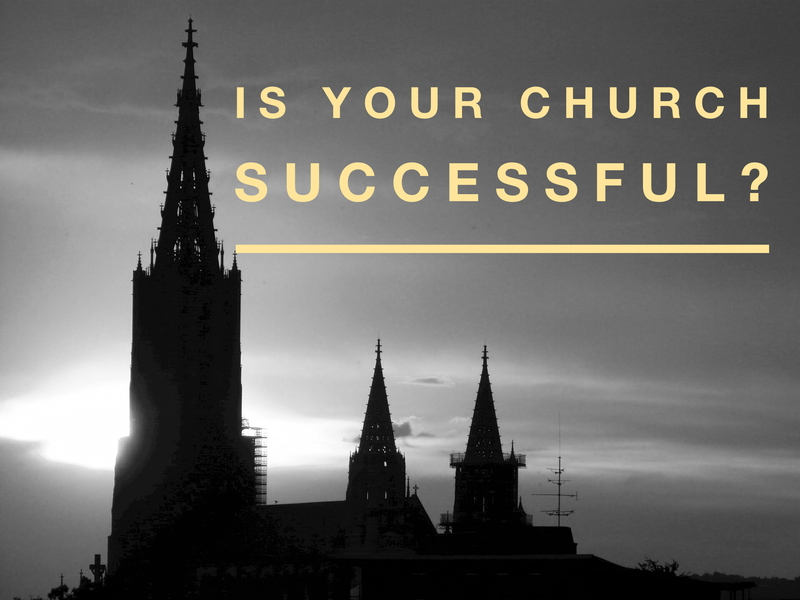 How Does a Church Measure Success? While every church leader and member may feel qualified to define how success is measured in their particular church, it is beneficial to look to those who have exposure to the larger Body of Christ when identifying success. The use of the term success when discussing Christian ministry creates concern for some. Some may equate this nomenclature with business models of success. Klopp assists us by addressing his use of terms other than success. He states, “Recently, there has been a resurgence of interest in church health, effectiveness and revitalization. I use the term effectiveness because it doesn’t carry the theological or secular baggage as do terms such as ‘missional’ or ‘success’.”  Whether we address the concepts in terms of success, effectiveness or health, we should all agree that we are addressing ways in which the church may fulfill the responsibilities and expectations placed upon it by Jesus Christ. The Church is not to exist in an effort to please people; we will give an account to God and must please Him in every way. This position would seem to some as an exaggeration; my experience concurs with their assessment. Shawn Lovejoy devoted an entire book to the concept of reevaluating and reestablishing the measurements of success in the church. He provides a list of common but unhealthy measurements, including comparing ourselves to others, copying what others are doing and condemning others who have success that we envy. He provides additional unhealthy approaches to church success, with some of the elements including numbers, activity, approval rating and fame. Lovejoy pleads with pastors to recalibrate their definitions of success and work toward healthier, more productive churches. Ed Stetzer and Thom S. Rainer encourage us to change the scorecard of measuring success in church. Program based, inwardly focused churches will accentuate those issues that appease consumers. Stetzer and Rainer say, “The old scorecard of the church valued the external measures of the three Bs: bodies, budget, and buildings. The North American culture likes to count and so does the church. So we count the number of people attending, the number of dollars being used, and the number of square feet being inhabited for the purpose of the church.” It is tempting to utilize such instruments because they are measureable and quantitative. Counting bodies is much simpler than measuring spiritual growth. We must, however, insist on interpreting success by godly standards, not by earthly ones. If we are to measure what constitutes a successful church, we must begin with some basics as described by Scripture. Jesus provided the power of the Holy Spirit to the church so that we may be “witnesses in Jerusalem, and in all Judea and Samaria, and to the ends of the earth.” (Acts 1:8 NIV). Paul explains the purpose of church leaders as “to equip his people for works of service, so that the body of Christ may be built up.” (Ephesians 4:11). Jesus assigned the Great Commission as the clarion call for the church: “Therefore go and make disciples of all nations, baptizing them in the name of the Father and of the Son and of the Holy Spirit, and teaching them to obey everything I have commanded you.” (Matthew 28:19-20a). For a church to be considered successful according to Biblical standards, emphasis must be placed on reaching those who are separated from God, releasing God’s people for ministry and making disciples everywhere. This seems to be a missional focus rather than an inwardly focused approach. It is a common assertion that this type of outwardly focused ministry will produce measureable, quantitative results such as increased attendance and giving. There is no biblical guarantee of this result and caution should be exercised when making such assumptions. A successful church will minister out of pure motivation to see lives changed. If God allows us to reach an increasing number of people, we are blessed. This should assist us as we attempt to keep our definition of ministry success pure. Leith Anderson addresses the idea of successful churches in two books he authored in the early 1990s. Along with a plethora of negative examples of success, he identifies the following: “Success is reaching the right goal, using our resources according to a specified standard.” I find that, without reading the book, this definition of success is vague and obscure. However, as Anderson develops his thoughts more fully, we find a solid didactic on church health. He focuses on the process of fulfilling mission, the utilization of gifts, and the necessity of adhering to Biblical standards while being flexible on non-essential issues. In his earlier work, Dying for Change, he eloquently argues for the church to stay focused on eternal issues refusing to compromise on Biblical truth while embracing the need to adjust methods as society shifts. “We cannot view the church as an island isolated from the rest of society. It cannot be isolated. As the culture changes, the church changes.” At least one aspect of the successful church must be considered as the ability to reach the world around it with the message of Jesus Christ. Given our primary goal is to lead others to Christ and to make disciples, if we fail at these two tasks, we are unsuccessful. If the church fails to make disciples, she will eventually become extinct. Anderson and other writers help us to see the balance of commitment to living a godly life while connecting with the culture we are trying to reach. Both are necessary in order for a church (or Christian) to be considered successful. Minatrea laments the dying church that refuses to adjust its methods to reach their community. It is my opinion that it is impossible to have a successful church that is irrelevant to its culture. The Bible is always relevant, regardless of the society. Churches can be guilty of making the Bible irrelevant. Admittedly, we are in a major struggle with a propensity by many to reduce the Bible to a storybook. Post-modernism has impacted the church to the point that many are fearful of preaching the truth. However, watering down the Scriptures has resulted in an anemic church that is unable to deliver what our culture needs the most. The most successful churches are the ones that “speak the truth in love” (Ephesians 4:15) and offer life and hope through the transformative power of Jesus Christ. With today’s post-Christian attitude, churches that speak Biblical truth may have difficulty amassing a large congregation. However, I believe that people are hungry for real solutions and eventually truth will prevail. This is another reason why success may not be measured by using standard analysis. Being culturally relevant should mean making the truth of God’s love accessible to all. Unfortunately, the idea has become convoluted and a point of contention for many Christian leaders. Robert Logan assisted me in my understanding of the topic. He instructs, “Being culturally relevant is actually another way of describing what incarnating the Gospel is all about. It means putting the Good News into forms that relate and communicate to people wherever they are.”  In my estimation, and utilizing this definition of culturally relevant, one may not consider their church successful unless they are culturally relevant. I read two works that seem especially congruent with this topic. Koster and Wagenfeld’s Take Your Church’s Pulse, and Stanley, Joiner and Jones’ 7 Practices of Effective Ministry are closely related to the task of determining success for the church. Both are efforts to identify key elements of a healthy and productive church. The 7 Practices text lists things that the church should do in order to become successful. A brief summary of the 7 practices is: 1. Clarify the Win (what do we want to celebrate? ); 2. Think Steps, not Program (where do we want our people to be? ); 3. Narrow the focus (do no more than one or two things well); 4. Teach Less for More (say only what you need to say to the people who need to hear it); 5. Listen to Outsiders (focus your efforts on those you are trying to reach rather than on those you’re trying to keep); 6. Replace Yourself (prepare now for the future); and 7. Work on It (step back and evaluate). These practices are publicized to create healthy environments in the church. They are not considered as indicators of success but rather are recipes for success. Personally, I find the authors of these practices to be a bit presumptive. I originally read this book with our local church staff when it was first published. We read and discussed the book and explored ways to implement the concepts contained in it. As it developed for us, many of the ideas of the authors were very specific to their context and not as easily executed in other settings. Our particular cultural context was not conducive to some of the practices. Thus, I am of the opinion that the book has limited application when considering how to determine success in the local church. A much more helpful resource in my quest to establish the elements of a successful church is Koster and Wagenveld’s Take Your Church’s Pulse. The book presents ten vital signs of a healthy church. The list is subdivided into five key commitments and five key functions. The five commitments are Clear and Inspiring Vision, Mobilizing Leadership, Motivated Ministering Body, Proper Stewardship of Resources, and Integration of Text and Context. According to the authors, implementation of these commitments will prepare and position the church to succeed in effective ministry. The five functions are listed as: Compelling Witness, Comprehensive Discipleship, Compassionate Service, Caring and Welcoming Community, and Dynamic Worship and Prayer. While these functions are practices of the church, they also serve as descriptors of an effective church. Healthy churches will participate in each of the functions listed. While I have not attempted to put into practice the comprehensive list as published by the authors, I have implemented each of the individual elements listed in a local church context. I believe that their list is synoptic and thorough. When attempting to identify key components of a successful church, we should utilize the index provided by Koster and Wagenveld. As we summarize our research on the fundamentals of successful church ministry, my concern for the church of the 21st century remains. In my assessment, many churches are attempting to conduct impactful ministry by performing tasks and carrying out programs in their own strengths and abilities without relying on the life-transformative power of the Holy Spirit. We sometimes operate as though we are the source of life-change. Church can become an organization rather than an organism. I am very much in favor of investigating and exploring ways that God is working in other churches. God allows us to view successes in other ministries so that we may be inspired and motivated to also enjoy progress. However, it is a mistake to attempt to duplicate in our ministry what God is doing elsewhere. Trends and methodology can become contagious and, if we are not careful, all of our churches can begin to look and act alike. Popular pastors can garner a following of younger pastors and the temptation is to try to fit into the mold of this version of success. This may explain why North American churches spend an inordinate amount of effort trying to gain members from other churches. There can be a way of leading ministry that is attractive to other Christians, but not to those who are living without Christ. We experience a significant amount of transfer growth but not enough conversion growth. Our cultures and communities are too diverse for us all to conduct ministry the same way. The unique challenges and needs of the people in our neighborhoods require that we approach church work from a distinct and personalized platform. We may learn from the failures and successes of other churches but what God desires to do in our particular situation is distinct. Every church, every pastor and every community is unique. If we view the solution as mimicking what others are doing, we stifle the creative work of the Holy Spirit. He desires us to follow His leading as we address the needs of the culture that surrounds us. While it is beneficial for us to explore the concepts that various writers espouse as indicators of healthy ministry, we must recall that the Church is the bride of Christ and will ultimately be judged only by Him. Only God truly knows what is happening in the deep recesses of the ministry. We look at the outward appearance, but God looks at the heart. It is a common temptation to hold others to our standards and to determine their success or failure based upon our criteria. It seems presumptuous and arrogant to determine some churches as successes and others as failures. Obviously, we can observe when a ministry practices the Scriptures and connects with its community. But we cannot measure true spiritual success. When I am bold enough to condemn a ministry as a failure, possibly I should submit to the Biblical teaching that instructs me to remove the log from my eye prior to attempting to remove the speck from my brother’s eye (Matthew 7:5). I am not insinuating that we stop evaluating ministry for success or failure. I am purporting that we enter into this process with humility and a keen awareness that we cannot accurately perceive what is true success and failure. Regardless of the limited number of members, the small facility and the miniscule budget, some churches are fulfilling the call that God has placed on them to make disciples, to release people for ministry and produce fruit that remains. On the contrary, some churches with massive numbers of attenders, a magnificent edifice and a swelling budget may possibly be viewed as a failure in the eyes of the Lord. This reminds us that every church is unique and has a specific calling to fulfill. We must operate in the power of the Holy Spirit in order to fulfill that call. It behooves us to concentrate our definition of the elements of a successful church. Ingredients such as worship, service, community, prayer and evangelism are crucial. Vision, stewardship, leadership development, outreach and proper handing of the text within the context are vital. We should explore these features with a sincere desire to be the best church we can possibly be. However, we must never place these elements ahead of complete and total obedience to what God is requiring of the specific church. In our efforts to determine what makes a church successful, we must be sure to be guided by the principle of the true purpose of the church: to bring glory to God and to share Christ with the world. I am convinced that, on Judgment Day, we will not be subjected to a checklist of modern expectations that are commonly considered to be criterion for success. I do believe that God will determine that day whether or not we have been obedient to Him and faithful to His call. Certainly, we hope and pray that we will hear these words spoken to us and to the church that we serve, “Well done, good and faithful servant! You have been faithful with a few things; I will put you in charge of many things. Enter into the joy of the Lord!” (Matthew 25:23). Anderson, Leith. Dying for Change: The New Realities Confronting Church and Para-Church Ministries. Minneapolis, MN. Bethany House Publishers, 1990. Anderson, Leith. A Church for the 21st Century: Bringing Change to Your Church to Meet the Challenges of a Changing Society. Minneapolis, MN. Bethany House Publishers, 1992. Appel, Gene and Alan Nelson. How to Change Your Church (Without Killing It). Nashville, TN, Word Publishing, 2000. Chester, Tim and Steve Timmis. Total Church: A Radical Reshaping Around Gospel and Community. Wheaton, IL, Crossway Publishing, 2008. Klopp, Henry. The Ministry Playbook: Strategic Planning for Effective Churches. Grand Rapids, MI, Baker Books, 2002. Koster, Tim and John Wagenveld. Take Your Church’s Pulse: Ten Vital Signs of a Healthy Church. (Sauk Village, IL, Multiplication Network Ministries, 2014. Logan, Robert E. Beyond Church Growth: Action Plans for a Developing Dynamic Church. Grand Rapids, MI. Fleming H. Revell Publishers, 1989. Lovejoy, Shawn. The Measure of Our Success: An Impassioned Plea to Pastors. Grand Rapids, MI, Baker Books, 2012. Minatrea, Milfred. Shaped by God’s Heart: The Passion and Practices of Missional Churches. San Francisco, California, Jossey-Bass, 2004. Powers, Bruce and James T. Roberson Jr. Church Administration Handbook. Nashville, TN, B&H Publishing, 2008. Schaller, Lyle E. The Very Large Church: New Rules for Leaders. Nashville, TN, Abingdon Press, 2000. Stanley, Andy, Reggie Joyner and Lane Jones. 7 Practices of Effective Ministry. (Sisters, OR, Multnomah Publishers, 2004. Stetzer, Ed and Thom Rainer. Transformational Church: Creating a New Scorecard for Congregations. Nashville, Tennessee B&H Publishing Group, 2010. Powers, Bruce and James T. Roberson Jr. Church Administration Handbook. (Nashville, TN, B&H Publishing, 2008), 13. Klopp, Henry. The Ministry Playbook: Strategic Planning for Effective Churches. (Grand Rapids, MI, Baker Books, 2002), 26. Chester, Tim and Steve Timmis. Total Church: A Radical Reshaping Around Gospel and Community. (Wheaton, IL, Crossway Publishing, 2008), 191. Lovejoy, Shawn. The Measure of Our Success: An Impassioned Plea to Pastors. (Grand Rapids, MI, Baker Books, 2012), 16-26, 34-35. Stetzer, Ed and Thom S. Rainer. Transformational Church: Creating a New Scorecard for Congregations. (Nashville, TN, B&H Publishing, 2010), 26. Appel, Gene and Alan Nelson. How to Change Your Church (Without Killing It). Nashville, TN, Word Publishing, 2000), 26. Schaller, Lyle E. The Very Large Church: New Rules for Leaders. (Nashville, TN, Abingdon Press, 2000), 128. Anderson, Leith. A Church for the 21st Century: Bringing Change to Your Church to Meet the Challenges of a Changing Society. (Minneapolis, MN. Bethany House Publishers, 1992), 89. Anderson. Dying for Change: The New Realities Confronting Church and Para-Church Ministries. (Minneapolis, MN. Bethany House Publishers, 1990), 43. Minatrea, Milfred. Shaped By God’s Heart: The Passion and Practices of Missional Churches. (San Francisco, CA. Jossey-Bass, 2004), 7. Logan, Robert E. Beyond Church Growth: Action Plans for a Developing Dynamic Church. Grand Rapids, MI. Fleming H. Revell Publishers, 1989, 69. Stanley, Andy, Reggie Joyner and Lane Jones. 7 Practices of Effective Ministry. (Sisters, OR, Multnomah Publishers, 2004), 10-11. Koster, Tim and John Wagenveld. Take Your Church’s Pulse: Ten Vital Signs of a Healthy Church. (Sauk Village, IL, Multiplication Network Ministries, 2014), 13.